Starting from next September, the TV series inspired to the Toys line distributed by Rocco Giocattoli will be on air! Maurizio Distefano The evolution of Licensing Agency announces the broadcast of the animated series Monchhichi, also on the Italian digital terrestrial channel Frisbee. Monchhichi, in fact, has already been on air since last November on DeA Junior, the Italian Pay TV channel present on Sky Satellite Platform. The Maurizio Distefano Licensing agency manages all the licensing rights of the show for the Italian market and is laying the foundations for the development of a licensing program that satisfies the demand and appetite for the series that is emerging among Italian children. The international Silverlit® group is the producer of an assorted line of toys that, thanks to the Maurizio Distefano Licensing agency, will be distributed in Italy starting from September by Rocco Giocattoli. Gianluca Giordano, Marketing Manager of Rocco Giocattoli said: “We are proud to be able to distribute the Monchhichi line in Italy, a historical brand rooted in the mind and in the heart of many generations. The restyling of the characters and the support that the licensing will give to the brand will surely make even the little ones thrill with the adventures of these cute little monkeys: the range that we will offer to the public is in fact linked to the complete line of playsets and figures in the TV series, and to the more classic line of plush toys of different sizes“. For more than forty years Monchhichi are world-wide known and have become part of the families, providing comfort to the little ones. 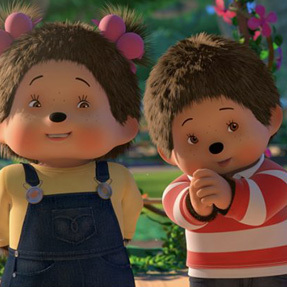 With over 100 million stuffed toys sold all over the world, Monchhichi are back as protagonists of their animated 3D series produced by Technicolor Animation. The brand, created in Japan in 1974 by Sekiguchi, now has an active and strong community on social networks , especially on Facebook. The famous toy that has fascinated several generations celebrates the return to the small screen and store shelves, offering potential licensees the opportunity to create a wide selection of products that feature both the original style of the character and the animated version.